As Marketing Manager, Thady is responsible for overseeing our marketing strategy, branding and PR. As well as creating almost all of our promotional material and adverts, Thady helpled to design all of our stationery, oversees the management and ongoing development of our website and advises on our social media accounts. Thady also assists with some in-house IT issues and oversaw the implementation of document management software which allows us to offer improved efficiency and increased quality of service to our clients. He graduated from Trinity College Dublin in 2014 with a degree in Economics & Philosophy. 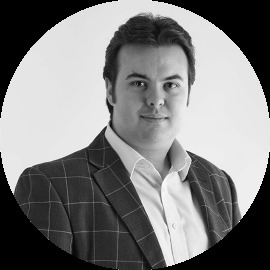 His analytical skills have been enhanced by his wide interest in subjects from maths to critical thinking and it is these skills which make Thady a valuable member of our team. When he’s not working his interests include playing traditional music on the fiddle, classical or pop in the piano, photography and food & drink. Yes, another foodie in the team; he’s really into making fresh pasta, bread and crumpets. He appreciates artisan loose leaf tea and freshly roasted ground coffee.